If there is a defining creative hen party workshop for 2019 it has to be the Floral Crown. This beautiful Floral Crown proves that more is more! 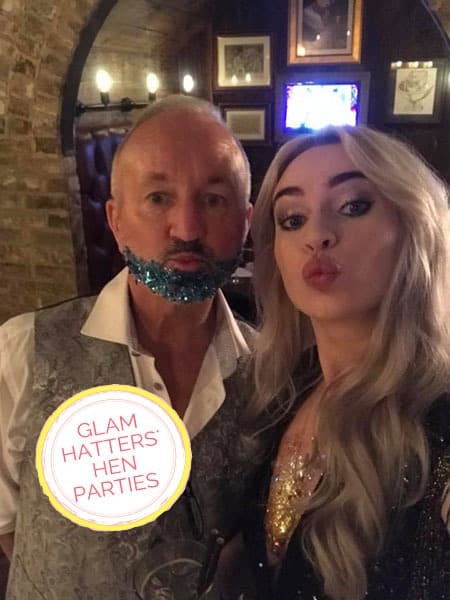 The Glam Hatter Girls have been running Flower Crown Workshops for hen parties and corporate events all over the country. But the Floral Crown Trend extends beyond stylish hen parties and corporate events. Take a look at the catwalks and you will see them littered with Flowers. 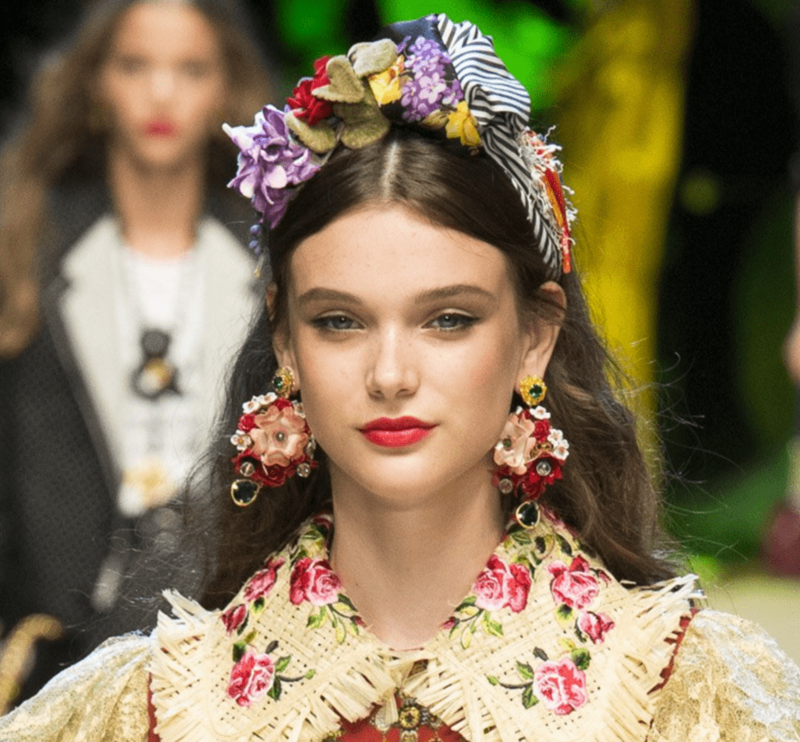 Dolce & Gabbana heavily featured floral Crowns on their Ready-To-Wear catwalk show. 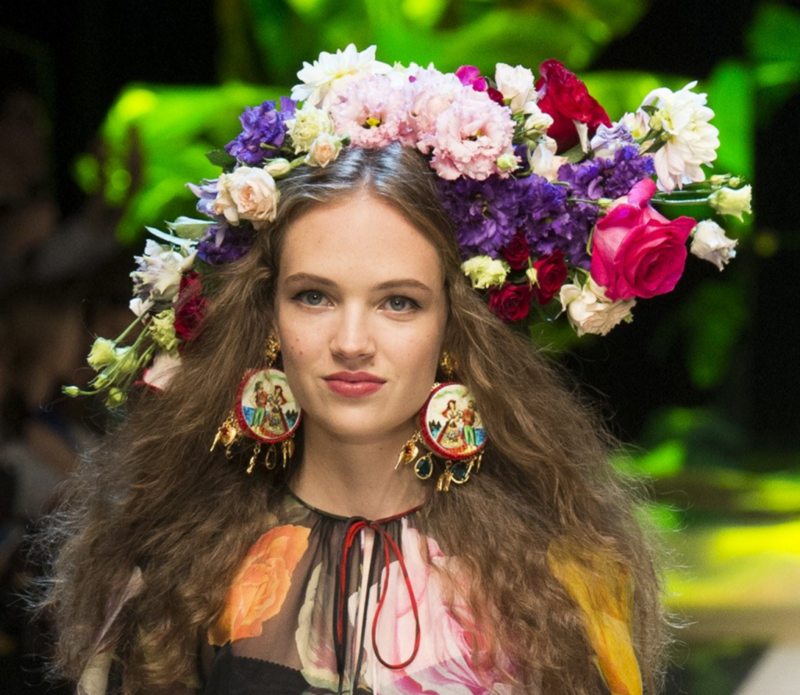 Here are some of the best Floral Crown Trends spotted at the show. Fabric, Leaves and Flowers – the perfect Floral Crown! 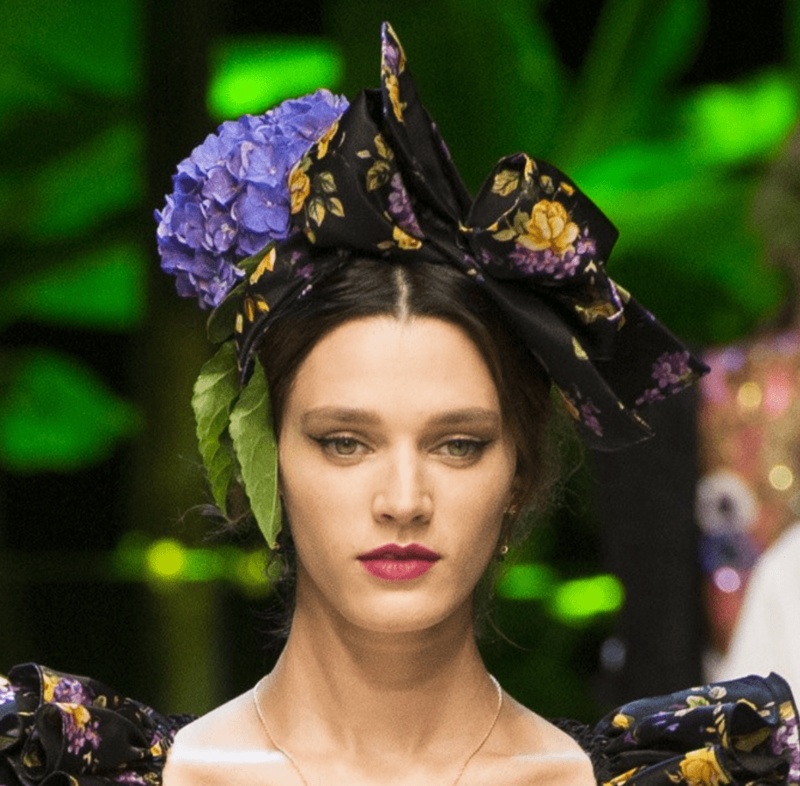 I loved all the headpieces at The Dolce & Gabbana show but I absolutely adored their take on the floral crown. It’s so good to see a show where the headpieces are an integral part of the outfits. As a milliner this gives me great joy. 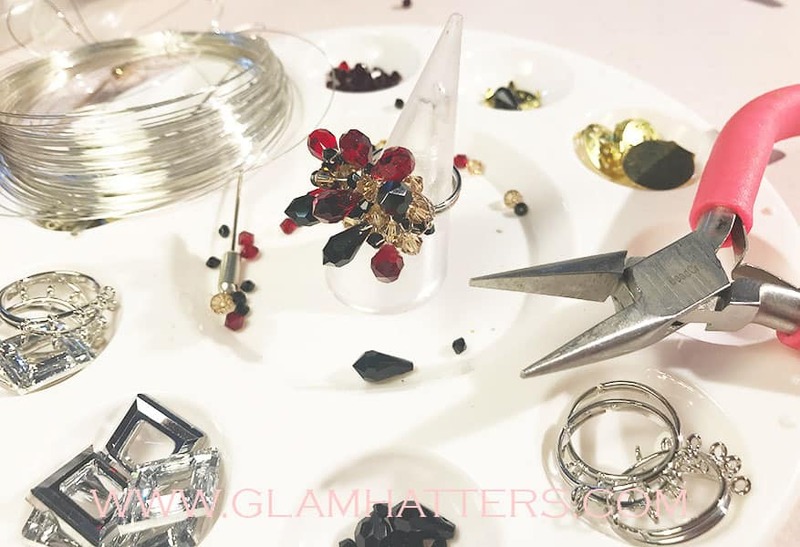 As a creative hen party organiser it lets me know that The Glam Hatters are super on trend with our workshop packages! Flower Crown with a printed flower scarf – love this combination! Right now we are hosting a huge amount of Floral Crown Workshops. 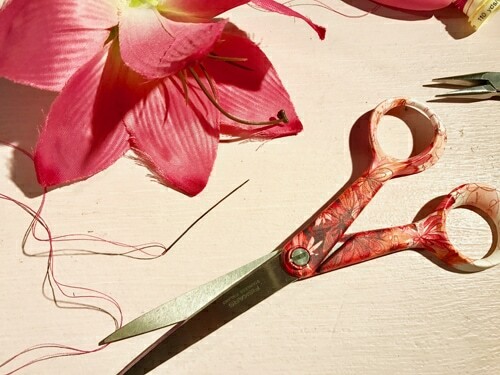 We are constantly knee deep in beautiful fabric Flowers. Prepping like a boss for our flower crown creative hen party and corporate workshops makes us super happy! Who wouldn’t be happy swimming in a rainbow sea of beautiful blooms?! Love these pink blooms – we have exactly this colour and shape flower in our hat boxes – among a load of other options! I love that every hen party that comes to us to make Floral Crowns leaves the hen party workshop wearing them! Flower Crowns are such a fun party accessory and a lovely way to let people know you are part of a hen party team. The girls get so many compliments when wearing them on a night out. 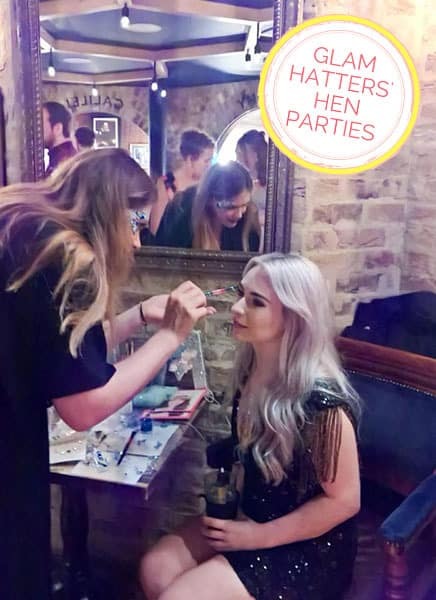 What a lovely way to spend your hen party. Often the bride-to-be will opt for white flowers to stand out from the rest of the party. My desk – you can just about make out my mac hiding behind the flowers! 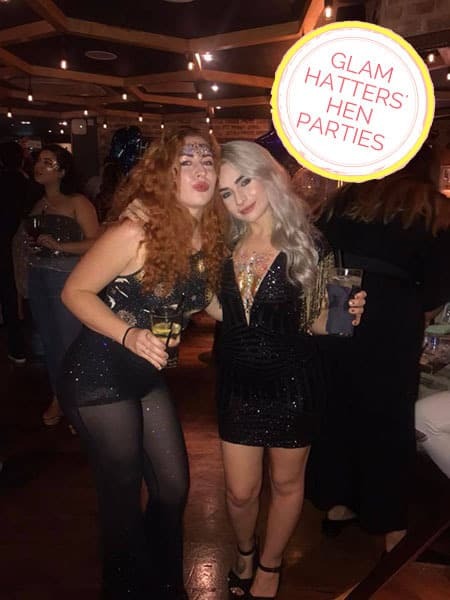 Book a Flower Crown hen party or corporate event with us. The Glam Hatter Girls host the best Flower Crown workshops please get in touch on the button below to hear more about our packages. 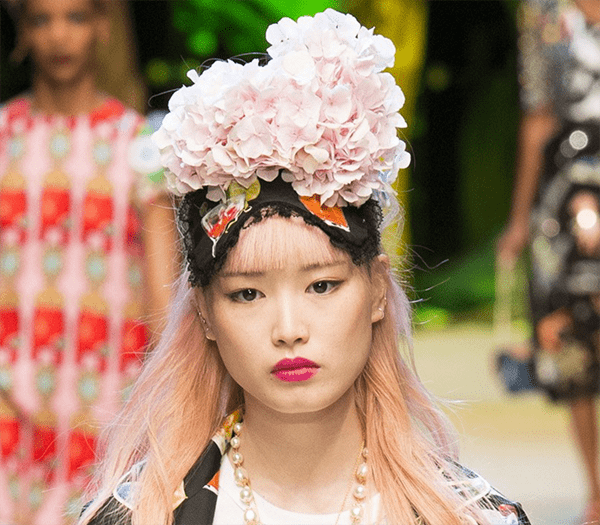 Take a look at our blog for more on the Floral Crown Trend. 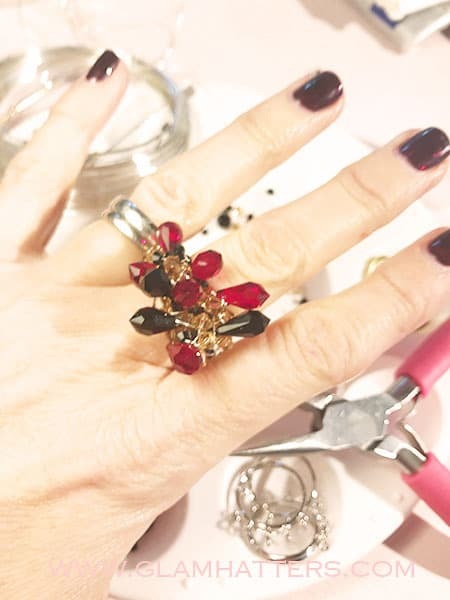 Flowernator – Brand New Workshop! 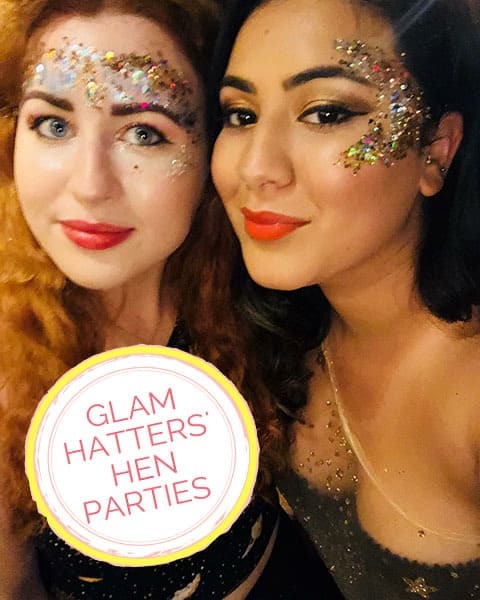 We have a brand new hen party workshop at Glam Hatters. 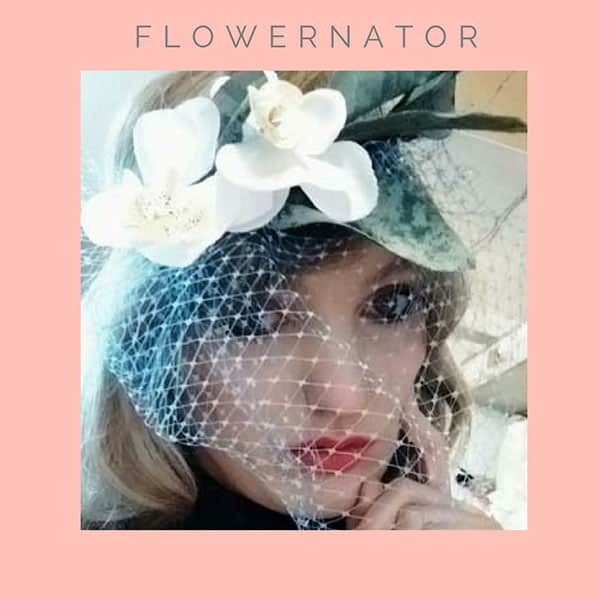 A Fascinator and a Flower Crown eloped to LA and nine months later the Flowernator arrives into the world! This is a super stylish workshop and the perfect hen party workshop for girls with a great sense of style. The Glam Hatter Girls will teach you step-by-step to make a gorgeous Flowernator with a beautiful bird-cage veil. Choose from a huge range of millinery bases and decorate with fabric flowers and leaves in a rainbow of colours. Top it off with a bird-cage veil for extra elegance. Just the thing to wear to the hen party or save it for a festival or boho wedding. Our flower crown workshops and fascinator workshops are both super popular. The flowernator is a way to combine the two styles. That way everyone in your group can be sure to make the style that really suits them. We have noticed that the twenty and thirty somethings in the group tend to go for the flower crown style. The Mum’s of the bride and Aunties really love the fascinator look. 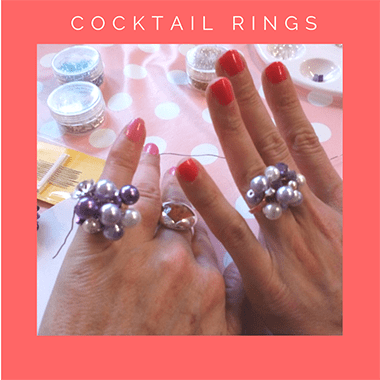 This workshop is the perfect combination of styles in a hen party workshop so that everyone can feel comfortable with the piece they make. The lovely thing about the fabric flowers is that they will last until the wedding. What a gorgeous group you will make wearing beautiful flowers and hats that you have all made. 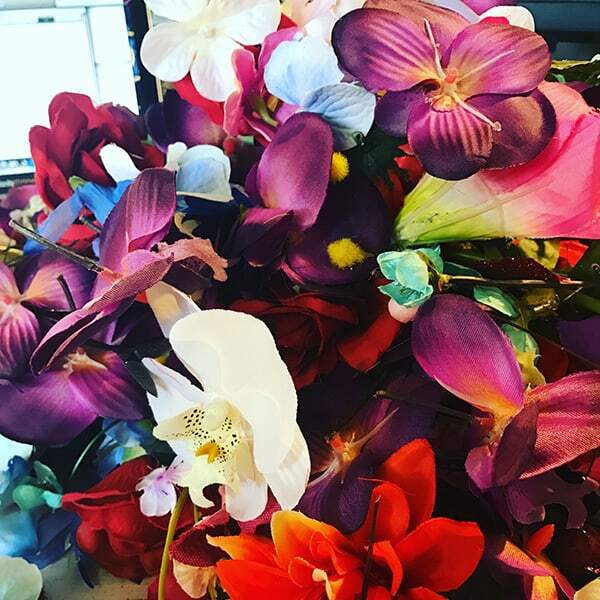 We have so many blooms to choose from and a huge range of coloured fascinator bases so you will make something to complement your outfit. 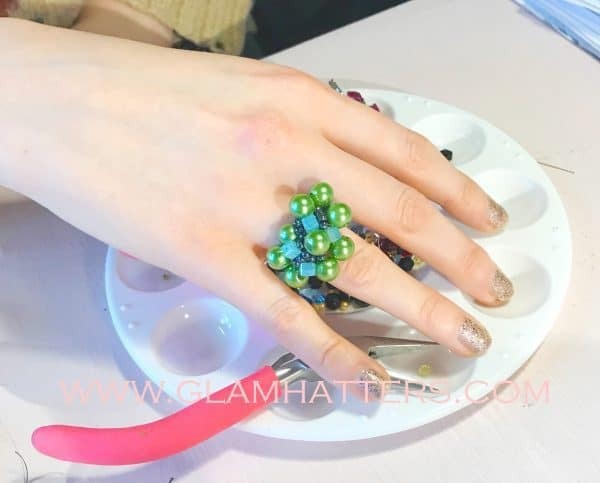 Bond with your group over style and colour choices and enjoy a crafty afternoon with our Glam Hatter Girls. 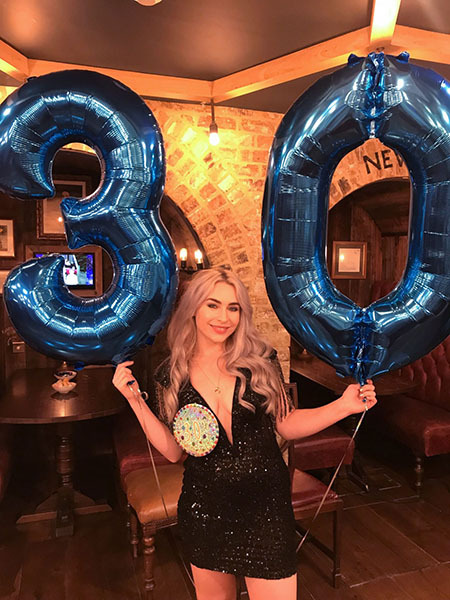 Our teachers are very experienced and will give you exactly the right amount of help to ensure you take away a headpiece that you love and are able to wear to the wedding. Oh and one more thing, you’ll have a whole lot of fun while you’re making! 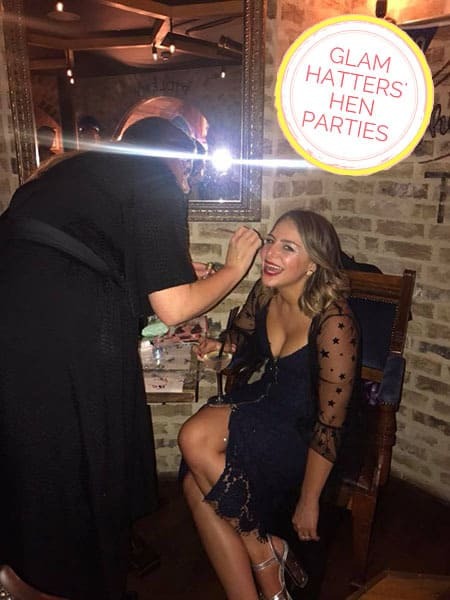 For all our hen party workshop details click here and for help booking your super stylish party contact Janie on the form below. We’d love to help you plan your hen party and promise you will have lots of fun with us!